Chinese demand for physical gold investment surged in the first three-quarters of 2017 while Americans ditched the shiny yellow metal for increased bets in the crypto mania and stock market bubble market. Even though China’s Hang Seng Stock Market outperformed the Dow Jones Index last year, Chinese citizens purchased the most gold bar and coin products Q1-Q3 2017 since the same period in 2013, when they took advantage of huge gold market price selloff. 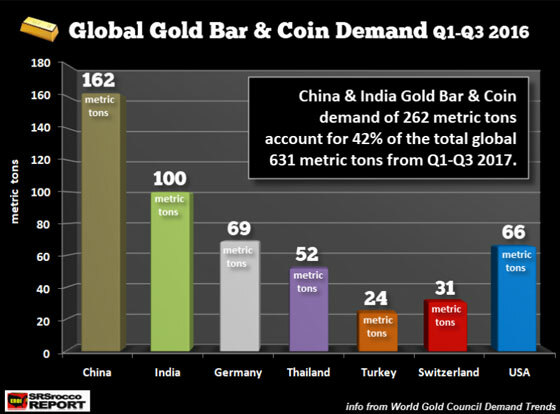 As we can see, China and India consumed 338 mt of gold bar and coin products which accounted for 47% of the total 715 mt Q1-Q3 2017. 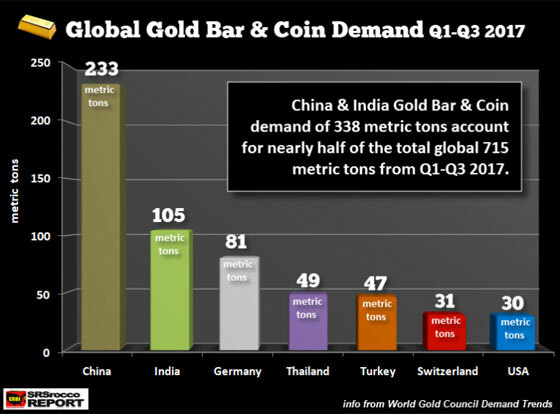 German gold bar and coin demand of 81 mt took the third highest spot followed by Thailand (49 mt), Turkey (47 mt), Switzerland (31 mt) and the United States (30 mt). Chinese gold bar and coin demand of 233 mt nearly equaled the total demand by German, Thailand, Turkey, Switzerland and the United States of 238 mt. While the increase in Chinese gold bar and coin demand was the big winner (162 mt to 233 mt), Turkish demand nearly doubled from 24 mt in 2016 to 47 mt this year. However, the biggest loser in the group was in the United States. U.S. Gold bar and coin demand fell substantially to 30 mt Q1-Q3 2017 from 66 mt during the same period last year. 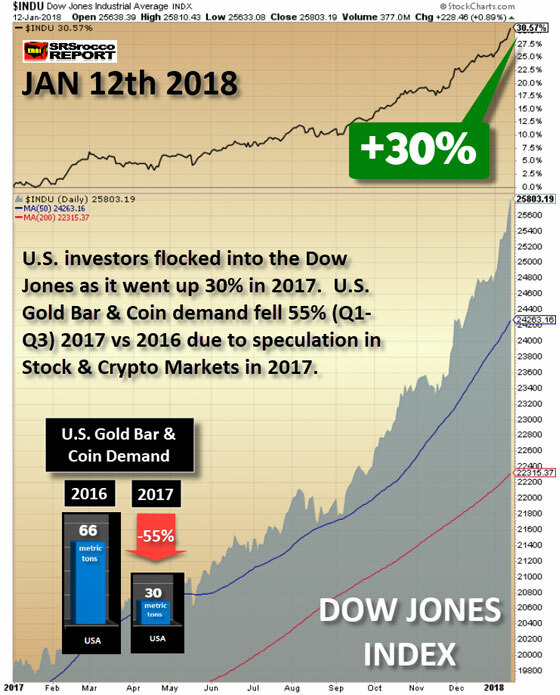 So, as the Dow Jones Index increased nearly 6,000 points, or 30% since the beginning of 2017, U.S. demand for gold bar and coins fell 55% (Q1-Q3 2017). Also, it makes perfect sense that American investors ditched gold for much larger 1,000+% gains in cryptocurrencies. The stunning performance in the stock and crypto markets has frustrated precious metals investors to no end. Not only do I see this all over the internet, but I also receive a lot of emails and comments on my blog. And, it doesn’t help that some precious metals investors, now turned crypto specialists and aficionados, are only happy discussing assets that make 10-20 baggers. Forget about old fashion work and taking the time and money to build something real, we have now moved into a new investment strategy that to be successful, one must make 6-7 figure returns by clicking on a mouse. All I can say is this… enjoy the Crypto fun while it lasts, because the forces of Gravity will once again bring us back down to earth where making a real living takes a lot of sweat and labor. While some followers sense that I am negative about the cryptocurrencies, I am. However, it is for a good reason. Even though the Blockchain technology offers interesting solutions, the speculative mania is a different story entirely. And, yes.. let’s not forget the tremendous amount of fraud and corruption in the crypto markets. If you don’t believe me, just wait around a while… LOL. 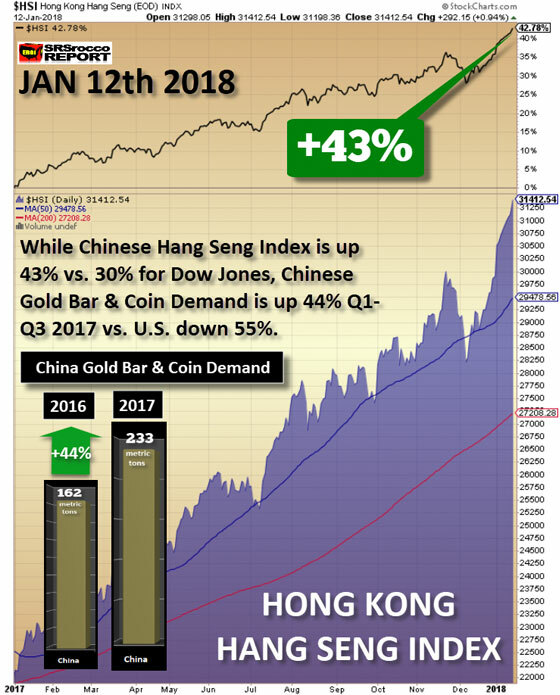 Even with their Hang Seng Index up higher than the Dow Jones, Chinese gold bar and coin demand increased by 44% while U.S. physical gold investment demand fell by 55%. Now, some may believe that the increase in Chinese gold and bar and coin purchases were partly due to the Chinese government banning the trading on cryptocurrency exchanges in the country. However, the crypto exchange ban did not take place until the last quarter of 2017. So, the 44% increase in Chinese gold bar and coin demand occurred before the banning of their cryptocurrency exchanges. Because of the crypto exchange ban, we may see a spike in Chinese gold bar and coin demand during Q4 2017 when the statistics are released. For whatever reason, Chinese physical gold investment demand increased significantly Q1-Q3 2017 while U.S. demand dropped like a rock. It will be interesting to see how 2018 unfolds and if the extreme leverage in the stock and crypto markets finally unravels. You see, it’s not a matter of if, it’s only a matter of time. And, while many believe the Dow Jones will continue higher forever, all markets have to correct. However, the next correction may turn out to be one heck of a crash.